The Hubble Space Telescope recently captured an image which shows the "colorful demise" of a sun-like star. According to NASA, "The star is ending its life by casting off its outer layers of gas, which formed a cocoon around the star's remaining core. Ultraviolet light from the dying star makes the material glow. The burned-out star, called a white dwarf, is the white dot in the center." It is located about 4,000 light-years from Earth. The agency further notes, "The planetary nebula in this image is called NGC 2440. The white dwarf at the center of NGC 2440 is one of the hottest known, with a surface temperature of more than 360,000 degrees Fahrenheit...The nebula's chaotic structure suggests that the star shed its mass episodically. During each outburst, the star expelled material in a different direction. This can be seen in the two bowtie-shaped lobes. The nebula also is rich in clouds of dust, some of which form long, dark streaks pointing away from the star." Our sun will ultimately burn out as well but no need for immediate concern as that will happen after about 5 billion years. The many sides of the supernova remnant Cassiopeia A. Located 10,000 light-years away in the northern constellation Cassiopeia, Cassiopeia A is the remnant of a once massive star that died in a violent supernova explosion 325 years ago. Hubble Space Telescope (HST), Spitzer Space Telescope. This NASA Hubble Space Telescope image shows one of the most complex planetary nebulae ever seen, NGC 6543, nicknamed the ?Cat's Eye Nebula.? Hubble reveals surprisingly intricate structures including concentric gas shells, jets of high-speed gas and unusual Lock-induced knots of gas. Estimated to be 1,000 years old, the nebula is a visual ?fossil record? of the dynamics and late evolution of a dying star. A preliminary interpretation suggests that the star might be a double-star system. The suspected companion star also might be responsible for a pair of high-speed jets of gas that lie at right angles to this equatorial ring. This NASA Hubble Space Telescope image captures the chaotic activity atop a three-light-year-tall pillar of gas and dust that is being eaten away by the brilliant light from nearby bright stars. This turbulent cosmic pinnacle lies within a tempestuous stellar nursery called the Carina Nebula, located 7,500 light-years away from Earth in the southern constellation Carina. The image celebrates the 20th anniversary of Hubble's launch and deployment into an orbit around Earth. Hubble's Wide Field Camera 3 observed the pillar on Feb. 1-2, 2010. This Hubble Space Telescope image of the star V838 Monocerotis (V838 Mon) reveals dramatic changes in the illumination of surrounding dusty cloud structures. The effect, called a light echo, has been unveiling never-before-seen dust patterns ever since the star suddenly brightened for several weeks in early 2002. The illumination of interstellar dust comes from the red supergiant star at the middle of the image, which gave off a pulse of light, somewhat similar to setting off a flashbulb in a darkened room. The dust may have been ejected during a previous explosion, similar to the 2002 event. This image, taken by the NASA/ESA Hubble Space Telescope, shows a peculiar galaxy known as NGC 1487, lying about 30 million light-years away in the southern constellation of Eridanus. Rather than viewing it as a celestial object, it is actually better to think of this as an event. Here, we are witnessing two or more galaxies in the act of merging together to form a single new galaxy. Each galaxy has lost almost all traces of its original appearance, as stars and gas have been thrown by gravity in an elaborate cosmic whirl. Unless one is very much bigger than the other, galaxies are always disrupted by the violence of the merging process. As a result, it is very difficult to determine precisely what the original galaxies looked like and, indeed, how many of them there were. In this case, it is possible that we are seeing the merger of several dwarf galaxies that were previously clumped together in a small group. Although older yellow and red stars can be seen in the outer regions of the new galaxy, its appearance is dominated by large areas of bright blue stars, illuminating the patches of gas that gave them life. This burst of star formation may well have been triggered by the merger. These blue-white stars are burning their hydrogen fuel so ferociously they will explode as supernovae in just a few million years. The combination of outflowing stellar “winds” and, ultimately, supernova blast waves will carve out cavities in nearby clouds of gas and dust. These fireworks will kick-start the beginning of a new generation of stars in an ongoing cycle of star birth and death. Most galaxies possess a majestic spiral or elliptical structure. About a quarter of galaxies, though, defy such conventional, rounded aesthetics, instead sporting a messy, indefinable shape. Known as irregular galaxies, this group includes NGC 5408, the galaxy that has been snapped here by the NASA/ESA Hubble Space Telescope. The galaxy resembles a giant maelstrom of glowing gas, rippled with dark dust that swirls inwards towards the nucleus. Messier 96 is a very asymmetric galaxy; its dust and gas are unevenly spread throughout its weak spiral arms, and its core is not exactly at the galactic center. Its arms are also asymmetrical, thought to have been influenced by the gravitational pull of other galaxies within the same group as Messier 96. It would be reasonable to think of this as a single abnormal galaxy, and it was originally classified as such. However, it is in fact a “new” galaxy in the process of forming. Two separate galaxies have been gradually drawn together, attracted by gravity, and have collided. We now see them merging into a single structure. The farthest and one of the very earliest galaxies ever seen in the universe appears as a faint red blob in this ultra-deep–field exposure taken with NASA's Hubble Space Telescope. This is the deepest infrared image taken of the universe. Based on the object's color, astronomers believe it is 13.2 billion light-years away. A ribbon of gas, a very thin section of a supernova remnant caused by a stellar explosion that occurred more than 1,000 years ago, floats in our galaxy. The supernova that created it was probably the brightest star ever seen by humans. This image from Hubble’s Wide Field Planetary Camera 2 showcases NGC 1501, a complex planetary nebula located in the large but faint constellation of Camelopardalis (The Giraffe). Discovered by William Herschel in 1787, NGC 1501 is a planetary nebula that is just under 5,000 light-years away from us. Astronomers have modeled the three-dimensional structure of the nebula, finding it to be a cloud shaped as an irregular ellipsoid filled with bumpy and bubbly regions. It has a bright central star that can be seen easily in this image, shining brightly from within the nebula’s cloud. This bright pearl embedded within its glowing shell inspired the nebula’s popular nickname: the Oyster Nebula. At first glance, Jupiter looks like it has a mild case of the measles. Five spots – one colored white, one blue, and three black – are scattered across the upper half of the planet. Closer inspection by NASA's Hubble Space Telescope reveals that these spots are actually a rare alignment of three of Jupiter's largest moons – Io, Ganymede, and Callisto – across the planet's face. In this image, the telltale signatures of this alignment are the shadows [the three black circles] cast by the moons. Io's shadow is located just above center and to the left; Ganymede's on the planet's left edge; and Callisto's near the right edge. Only two of the moons, however, are visible in this image. Io is the white circle in the center of the image, and Ganymede is the blue circle at upper right. Callisto is out of the image and to the right. This NASA/ESA Hubble Space Telescope image shows the region around a star known as R Sculptoris, a red giant located 1,500 light-years from Earth in the constellation of Sculptor. Recent observations have shown that the material surrounding R Sculptoris actually forms a spiral structure — a phenomenon probably caused by a hidden companion star orbiting the star. Systems with multiple stars often lead to unusual or unexpected morphologies, as seen, for example, in the wide range of striking planetary nebulae that Hubble has imaged. This image shows the center of the globular cluster Messier 22, also known as M22, as observed by the NASA/ESA Hubble Space Telescope. Globular clusters are spherical collections of densely packed stars, relics of the early years of the Universe, with ages of typically 12 to 13 billion years. This is very old considering that the Universe is only 13.8 billion years old. In a nearby galaxy called the Small Magellanic Cloud, young stars are spewing radiation that’s eating away at the cloud of gas and dust that gave birth to them not too long ago. This Hubble image, taken with the Advanced Camera for Surveys, shows that scene. The giant nebula NGC 3603 is a prominent star-forming region in the Carina spiral arm of our galaxy, about 20,000 light-years away. Discovered by Sir John Herschel in 1834, it is the largest nebula seen in visible light in the Milky Way. Within its core is nestled a stellar “jewel box” of thousands of sparkling young stars, one of the most massive young star clusters in the Milky Way Galaxy. This esthetic close-up of cosmic clouds and stellar winds features LL Orionis, interacting with the Orion Nebula flow. Adrift in Orion's stellar nursery and still in its formative years, variable star LL Orionis produces a wind more energetic than the wind from our own middle-aged Sun. As the fast stellar wind runs into slow moving gas a shock front is formed, analogous to the bow wave of a boat moving through water or a plane traveling at supersonic speed. The small, arcing, graceful structure just above and left of center is LL Ori's cosmic bow shock, measuring about half a light-year across. The slower gas is flowing away from the Orion Nebula's hot central star cluster, the Trapezium, located off the upper left corner of the picture. In three dimensions, LL Ori's wrap-around shock front is shaped like a bowl that appears brightest when viewed along the "bottom" edge. The beautiful picture is part of a large mosaic view of the complex stellar nursery in Orion, filled with a myriad of fluid shapes associated with star formation. An undated handout picture by NASA/ESA shows around 5,500 galaxies seen through the Hubble telescope. The time exposure titled 'Hubble extreme Deep Field' (XDF reveals galaxies up to 13.2 billion light-years from earth. Sun Seasons: Our sun is constantly changing. It goes through cycles of activity - swinging between times of relative calm and times when frequent explosions on its surface can fling light, particles and energy out into space. This activity cycle peaks approximately every 11 years. New research shows evidence of a shorter time cycle as well, with activity waxing and waning over the course of about 330 days. Understanding when to expect such bursts of solar activity is crucial to successfully forecast the sun's eruptions, which can drive solar storms at Earth. These space weather events can interfere with satellite electronics, GPS navigation, and radio communications. The quasi-annual variations in space weather seem to be driven by changes in bands of strong magnetic field that are present in each solar hemisphere. Star V838 Monocerotis's (V838 Mon) light echo, which is about six light years in diameter, is seen from the Hubble Space Telescope in this February 2004 handout photo released by NASA on December 4, 2011. Light from the flash is reflected by successively more distant rings in the ambient interstellar dust that already surrounded the star. V838 Mon lies about 20,000 light years away toward the constellation of Monoceros the unicorn. It became the brightest star in the Milky Way Galaxy in January 2002 when its outer surface greatly expanded suddenly. This false-color composite image shows the Cartwheel galaxy. Hubble Space Telescope. In this composite image provided by NASA, ESA, globular star cluster Omega Centauri (NGC 5139) in the Centaurus constellation and the Hubble SM4 ERO Team, is pictured July 15, 2009 in Space. Today, September 9, 2009, NASA released the first images taken with the Hubble Space Telescope since its repair in the spring. What resemble dainty butterfly wings are actually roiling cauldrons of gas heated to more than 36,000 degrees Fahrenheit. The galaxy cluster Abell S1063, located 4 billion light-years away, is pictured in this undated handout Hubble Telescope image surrounded by magnified images of galaxies much farther. The photo unveils the effect of space warping due to gravity. The huge mass of the cluster distorts and magnifies the light from galaxies that lie far behind it due to an effect called gravitational lensing, first predicted by Einstein a century ago. NASA's Hubble Space Telescope took this photo, released on March 1, 2007, of Jupiter with Hubble's Wide Field Planetary Camera 2 on February 17, 2007, using the planetary camera detector. Jupiter's trademark belts and zones of high- and low-pressure regions appear in crisp detail. Circular convection cells can be seen at high northern and southern latitudes. The sky is seen at night just before the predicted merger between our Milky Way galaxy and the neighboring Andromeda galaxy, in this NASA photo illustration released May 31, 2012. About 3.75 billion years from now, Andromeda's disk will fill the field of view and its gravity will begin to create tidal distortions in the Milky Way. The view is inspired by dynamical computer modeling of the future collision between the two galaxies. The two galaxies collide about 4 billion years from now and merge to form a single galaxy about 6 billion years from now. The central region of our Milky Way galaxy. Hubble, Spitzer and Chandra. The photo, taken by NASA's Hubble Space Telescope, captures a small region within M17, a hotbed of star formation M17, also known as the Omega or Swan Nebula, is located about 5,500 light-years (1690 parsecs) from Earth in the constellation Sagittarius. The turbulent gases in this photo of Gaseous Nebula in the Milky Way Galaxy shows roughly 1.9.arcminutes (3.1 light-years or 0.95 parsecs) across. The image is being released to commemorate the 13th anniversary of Hubble's launch on April 24, 1990. UNSPECIFIED - 1992: Composite image, taken by Hubble Space Telescope's Wide Field & Planetary Camera, of hypersonic shock wave (lower right) of material (clouds of dust) moving through Orion Nebula, surrounding (relatively) newborn stars. 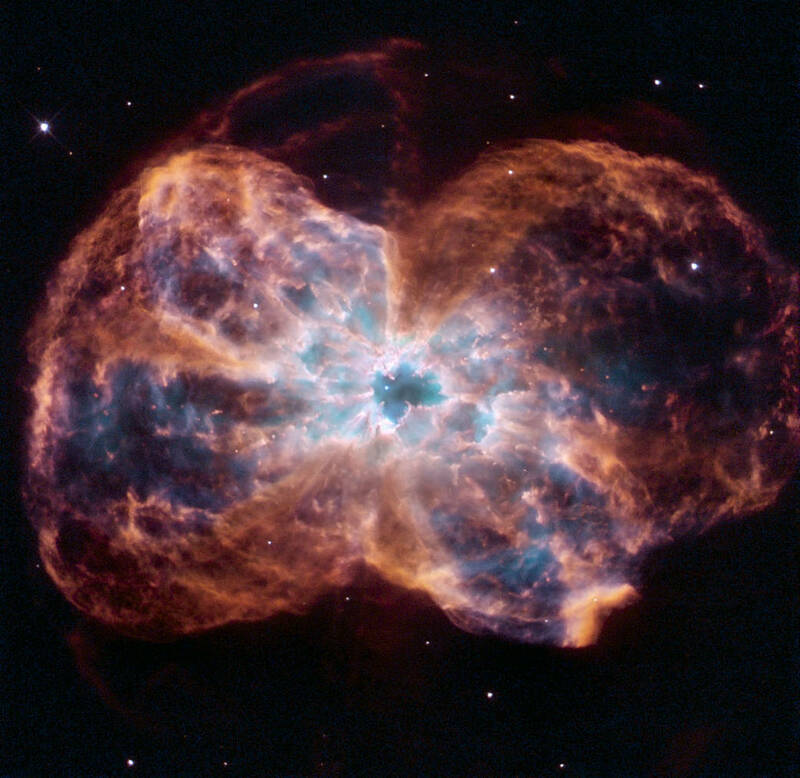 The Hubble Space telescope's soon-to-be decommissioned Wide Field Planetary Camera 2 photographed this image of planetary nebula K 4-55 as its final image, released by NASA May 10, 2009. This Hubble image was taken by WFPC2 on May 4, 2009. The colors represent the makeup of the various emission clouds in the nebula: red represents nitrogen, green represents hydrogen, and blue represents oxygen. K 4-55 is nearly 4,600 light-years away in the constellation Cygnus. NASA's Hubble Space Telescope, in this undated image, has released on April 24, 2007, one of the largest panoramic images ever taken with Hubble's cameras, a 50-light-year-wide view of the central region of the Carina Nebula where a maelstrom of a star's birth and death is taking place. An image of four moons of Saturn passing in front of their parent planet in seen this image taken by NASA's Hubble Space Telescope February 24, 2009 and released by NASA March 17, 2009. In this view, the giant orange moon Titan casts a large shadow onto Saturn's north polar hood. Below Titan, near the ring plane and to the left, is the moon Mimas, casting a much smaller shadow onto Saturn's equatorial cloud tops. Farther to the left, and off Saturn's disk, are the bright moons Dione and the fainter Enceladus. Planetary nebula NGC 2818 in the southern constellation of Pyxis (The Compass). Glowing layers and shell of gas were created when a star shed its outer layers into space after running out of nuclear fuel. Hubble image of Arp 148 is the staggering aftermath of an encounter between two galaxies, resulting in a ring-shaped galaxy and a long-tailed companion. The collision between the two parent galaxies produced a shockwave effect that first drew matter into the center and then caused it to propagate outwards in a ring. The elongated companion perpendicular to the ring suggests that Arp 148 is a unique snapshot of an ongoing collision. Infrared observations reveal a strong obscuration region that appears as a dark dust lane across the nucleus in optical light. Arp 148 is nicknamed "Mayall's object" and is located in the constellation of Ursa Major, the Great Bear, approximately 500 million light-years away. This interacting pair of galaxies is included in Arp's catalog of peculiar galaxies as number 148. This image is part of a large collection of 59 images of merging galaxies taken by the Hubble Space Telescope and released on the occasion of its 18th anniversary on April 24, 2008. Thousands of sparkling young stars nestled within the giant nebula NGC 3603. This stellar 'jewel box' is one of the most massive young star clusters in the Milky Way Galaxy. NGC 3603 is a prominent star-forming region in the Carina spiral arm of the Milky Way, about 20,000 light-years away. This image shows a young star cluster surrounded by a vast region of dust and gas. The image reveals stages in the life cycle of stars. The nebula was first discovered by Sir John Herschel in 1834. The image spans roughly 17 light-years. The barred spiral galaxy M83, also known as the Southern Pinwheel, is seen in a NASA Hubble Space Telescope mosaic released January 9, 2014. The Hubble photograph captures thousands of star clusters, hundreds of thousands of individual stars, and "ghosts" of dead stars called supernova remnants. IN SPACE - This undated image taken by the Hubble telescope shows Pluto and its moons: Charon, Nix, and Hydra.The International Astronomical Union announced on August 24, 2006 that it no longer considers Pluto a planet, a status it has held since its discovery in 1930. The announcement reduces the solar system from nine planets to eight. A new view of the Whirlpool Galaxy, one of the largest and sharpest images Hubble Space Telescope has ever taken, is released by NASA. A new view of the Eagle Nebula, one of the two largest and sharpest images Hubble Space Telescope has ever taken, is released by NASA on Hubble's 15th anniversary April 25, 2005. The new Eagle Nebula image reveals a tall, dense tower of gas being sculpted by ultraviolet light from a group of massive, hot stars. During the 15 years Hubble has orbited the Earth, it has taken more than 700,000 photos of the cosmos. Galaxy Ngc 5866, Image Of The Disk Galaxy Ngc 5866 Taken With The Advanced Camera For Surveys (Acs) On The Hubble Space Telescope, November 2005. NASA's Hubble Space Telescope catches the Boomerang Nebula in this image taken with the Advanced Camera for Surveys in early 2005 and released on September 13, 2005. This reflecting cloud of dust and gas has two nearly symmetric lobes of matter that are being ejected from a central star. Each lobe of the nebula is nearly one light-year in length, making the total length of the nebula half as long as the distance from the Sun to the nearest neighbors-the Alpha Centauri stellar system, located roughly 4 light-years away. The Boomerang Nebula resides 5,000 light-years from Earth. Hubble's sharp view is able to resolve patterns and ripples in the nebula very close to the central star that are not visible from the ground. Some stars aren't born, they're hatched from interstellar gas pockets called EGGS (Evaporating Gas Globules) at the end of vast tubes known as "elephant trunks", according to new Hubble Space Telescope images released November 2. This picture was taken April 1 1995 by the Hubble Space Telescope Wide Field Camera of gas pillars in M16 Eagle Nebula. A composite image of the Crab Nebula showing X-ray (blue), and optical (red) images superimposed is shown in this undated photo. Multiple observations made over several months with NASA's Chandra X-ray Observatory and the Hubble Space Telescope captured the spectacle of matter and antimatter propelled to nearly the speed of light by the Crab pulsar, a rapidly rotating neutron star the size of Manhattan. What may first appear as a sunny side up egg is actually NASA Hubble Space Telescope's face-on snapshot of the small spiral galaxy NGC 7742 released October 21 by the Hubble Heritage Program. This spiral is known to be a Seyfert 2 active galaxy, a type of galaxy that is probably powered by a black hole residing in its core. Hubble Image of Galaxies' El Dorado NASA's Hubble Space Telescope has produced this beautiful image of the galaxy NGC 1483. NGC 1483 is a barred spiral galaxy located in the southern constellation of Dorado ? the dolphinfish (or Mahi-mahi fish) in Spanish. The nebulous galaxy features a bright central bulge and diffuse arms with distinct star-forming regions. In the background, many other distant galaxies can be seen. The constellation Dorado is home to the Dorado Group of galaxies, a loose group comprised of an estimated 70 galaxies and located some 62 million light-years away. The Dorado group is much larger than the Local Group that includes the Milky Way (and which contains around 30 galaxies) and approaches the size of a galaxy cluster. Galaxy clusters are the largest groupings of galaxies (and indeed the largest structures of any type) in the universe. A globular star cluster called Messier 5 (M5) containing 100,000 stars or more and packed into a region around 165 light-years in diameter is seen in an undated image taken by NASA's Hubble Space telescope and released April 25, 2014. Messier 5 lies some 25,000 light-years away and its stars are estimated to be nearly 13 billion years old, according to NASA.